Selecting components for your PCB design and determining correct placement is crucial for high-functioning boards that work the first time. However, in today’s age of automation, selecting the right parts can be a major challenge, especially when you need fully assembled boards fast. Use the articles below to learn more about the challenges and techniques of working with different parts, as well as guidelines and recommendations for component placement. A fully functioning circuit board is the goal of any PCB designer. Yet, it’s possible to take your design a step further and create a high-performance board that is easy to manufacture and assemble in order to save time and money. While every board is different, there are some general guidelines for component placement that will help you design a professional board that easily can be fabricated and assembled. Download this article to read our recommended component placement tips. Electronic product delays are becoming common place. In fact, customers almost expect products to be delayed by weeks or months after they’re promised. Delays also affect manufacturers by giving competitors time to enter the market. With no end to the shortage in sight, here are 5 things you can do now to keep your PCB projects on-time and on-budget despite the challenging conditions. 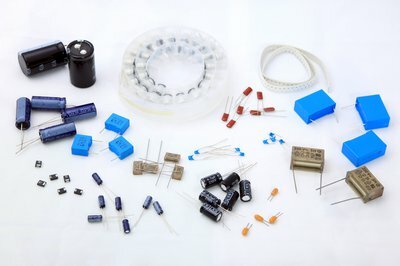 Selecting the right components can feel overwhelming. With so many options and placement considerations its easy to understand how mistakes are made. Read this article to avoid seven of the most commonly overlooked elements of component PCB design. Love them or hate them, ball grid arrays (BGAs) are being used more and more by design engineers all over the world. With high pin density and low lead inductance, BGAs are essential in today’s intricate PCB designs. However, those same characteristics can create some unique challenges. While much has been written on BGAs, this 4-page guide is a good starting point for using BGAs in your designs. Break out or “fan out” is a process used for getting traces out from underneath the board when working with BGAs. There are a number of different methods for breaking out traces, so of which can increase cost and complexity. In this article, read common methods for breaking out BGAs. Different SMT packages are used for different types of components, and it can be a challenge to determine which ones are the best for your projects. 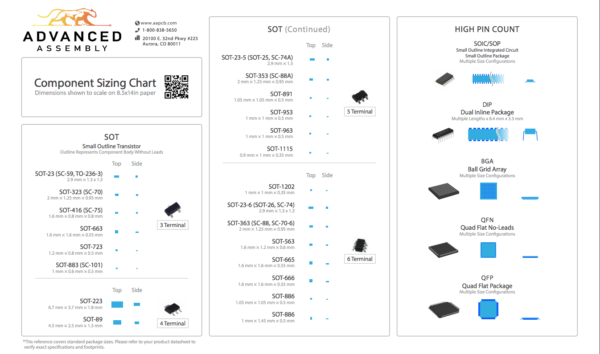 Click to print Component Sizing Chart. The miniaturization of electronics likely will continue for the foreseeable future. When working with small parts, it’s helpful to follow some general design guidelines on elements such as PCB mounting pads, trace width, solder paste, package placement, and more. Read this 3-page article for advice when incorporating small parts into your design. 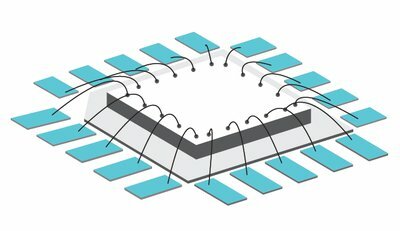 When they look at an integrated circuit, most people do not realize that what they are looking at is simply the package that encapsulates the actual IC or “the brains.” Integrated circuit packaging is something that happens to parts before they ever leave the manufacturing facility meaning that most designers and engineers never see the raw IC itself. Although the encapsulated IC may be the portion that brings value to the overall product, the package has an incredibly large effect on many different aspects of performance. While different packages are promoted by different manufacturers along with their specific pros and cons, this article will discuss the packages in general and the different attributes to consider when making a selection.